So a friend of mine wanted me to make three and a half Wee Mouse Tin House's for her kids for Christmas. It took me a while because I only work at night after the kids are in bed. But here they are! They turned out really cute and I learned how to embroider a little! If you want to make these for someone you know go here. They turned out really cute. 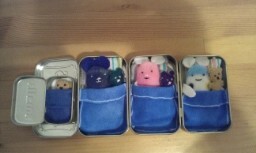 Each Altoid tin has a pillow, blanket, sheet, mouse and teddy bear. The mini Altoid tin doesn't have a pillow or mouse because it was too small. Aw! I'm glad you enjoyed the pattern. Those turned out really cute! Thanks so much for sharing the link! So super cute! I bet kids would love this!